Last night I was lucky enough to be able to attend Game 3 of the Stanley Cup Final and we invited three collectors along to enjoy the experience. This is the part where I’ll get at least fifty emails from collectors yelling at me for not bringing them. I’m sorry we couldn’t bring everyone we would have liked to, but we did the best we could with the multitude of requests we had. And more than anything, I’m happy to say I work for a company that would be willing to use these tickets with actual collectors. Often times opportunities like this go to big wigs at large retail chains or other corporate partners, but Upper Deck proves time and time again that we love to share these experiences with our most loyal fans. 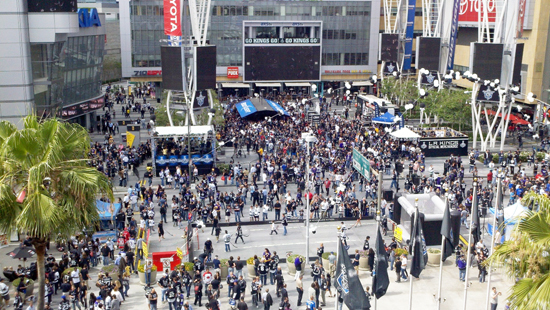 When we got up there, Staples Center and L.A. Live were going absolutely crazy. Now I have been to a fair amount of playoff events there, but never had I felt energy and anticipation like this. Los Angeles Kings fans have been waiting for this moment for so long and now that it was here, they just seemed beside themselves. 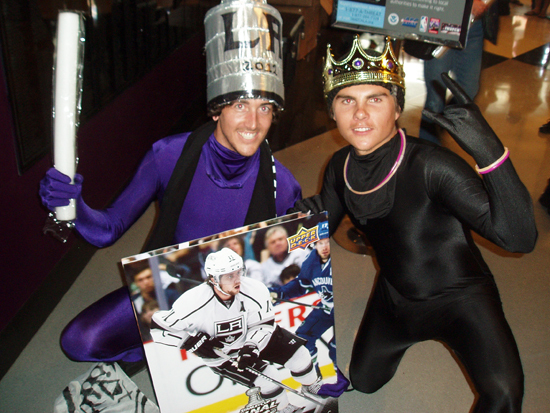 I had our Pre-Press team print up two oversize Los Angeles Kings cards of Anze Kopitar and Jonathan Quick for us to have some fun with at the game. It wasn’t easy getting them by security, but I was able to talk my way through luckily. 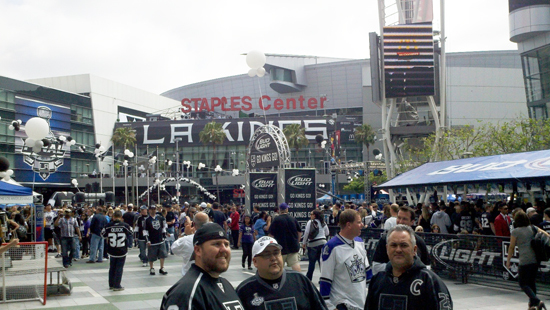 Fans were super fired up for the game and Staples was about as loud as Staples gets. These two super fans took a moment to pose with Anze Kopitar! 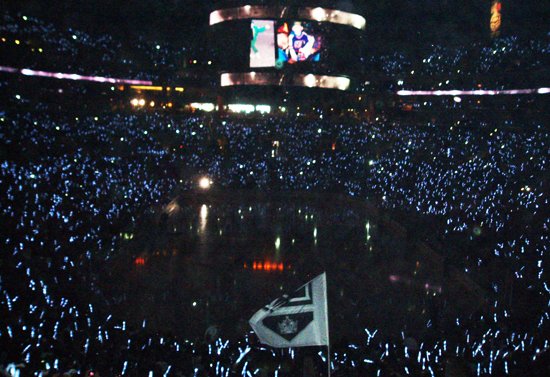 Fans were given light sticks to wave during the pre-game festivities. 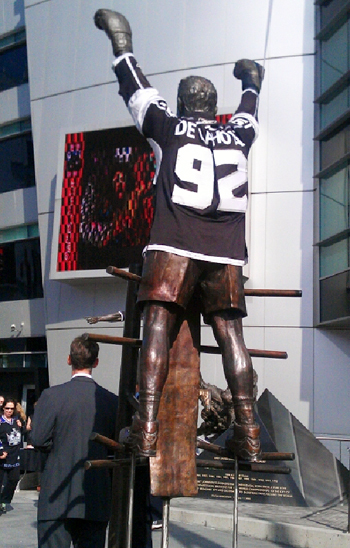 Upper Deck exclusive spokesman Wayne Gretzky returned to LA to drop the ceremonial puck for Game 3. During a break in the action in the first period I found a camera operator and gave them a wave with one of the blow-up cards and they panned over to me. I started doing a comical dance with the Jonathan Quick card and next thing you know, I’m on the jumbotron making moves. If I have to embarrass myself a little bit to promote the trading card category, I’m more than happy to do it. 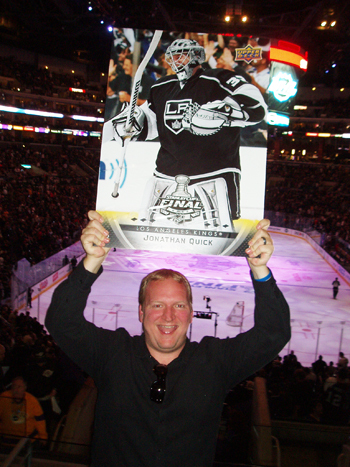 I scored some face time on the jumbotron with my good friend Jonathan Quick at Staples! 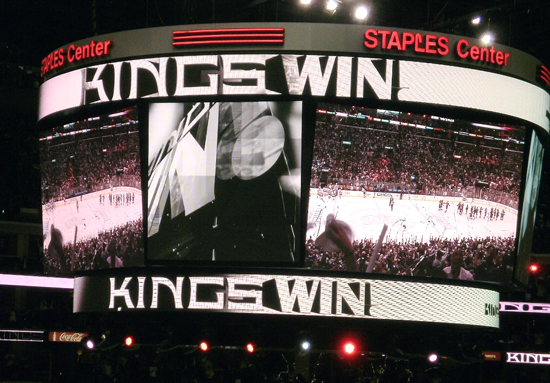 Now I’m not saying I was the inspiration to help the Kings find the net, but they started scoring early and often after my jumbotron dance. 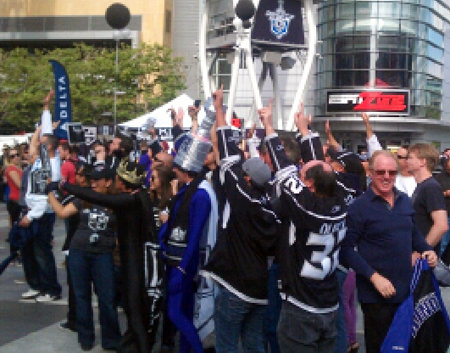 And when the Kings scored, the place went CRAZY!!! After the game we put up the blow-ups behind the post game show to get some extra exposure there. 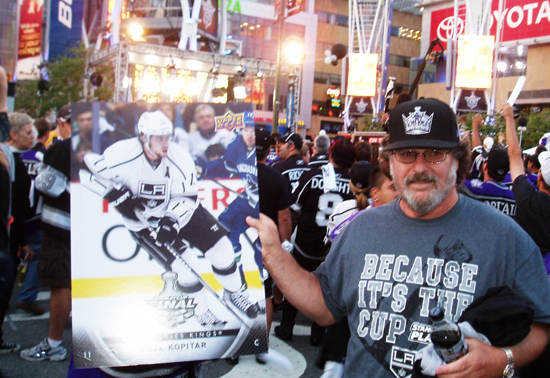 I met a die-hard Kings fan who couldn’t bring his son to the game so I hooked him up with one of the blow-up cards. He was beyond thrilled to have such a cool collectible to share with his son. Fans were still going nuts as I walked back to the car. It was pretty awesome when a convoy of fire engines drove by honking to the thousands walking around the arena anticipating what’s next. 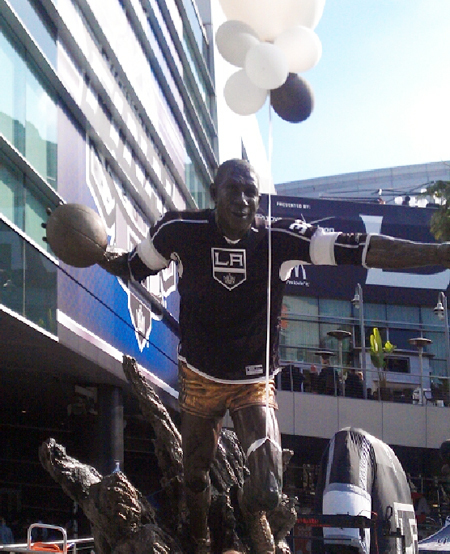 Most believe the Los Angeles Kings will win it all tomorrow in Game 4 of the Stanley Cup Final. Upper Deck has a special surprise for fans attending the game as we will be giving away 20,000 six-card packs of Stanley Cup Final Kings cards. 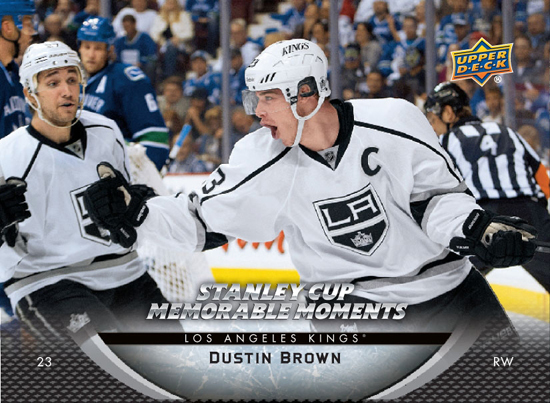 Included in the set is a “Memorable Moment” card of team captain Dustin Brown commemorating his pair of short-handed goals in the first-round series against the Vancouver Canucks. So if you make it to the game, raise your Upper Deck cards high in the air and find that cameraman; you just might wind up on the jumbotron! Grab this card and five others celebrating the LA Kings Stanley Cup run at Game 4 this week!